If the aircraft you are purchasing was previously registered in the United States, you should immediately submit evidence of ownership, an AC Form 8050-1, Aircraft Registration Application, and the registration fee to AFS-750 upon closing. Fees required for aircraft registration may be paid by check or money order made payable to the Treasury of the United States. AC Form 8050-2, Aircraft Bill of Sale, meets the FAA’s requirements for evidence of ownership. An AC Form 8050-2 does not need to be notarized. AC Forms 8050-1 and 8050-2 can be obtained from the nearest FSDO, and include information and instruction sheets. Figure 4-3 is a sample AC Form 8050-2. Figure 4-3. AC Form 8050-2, Aircraft Bill of Sale. You can download the form and obtain instructions for completing FAA Form 8050-2 on the FAA website at www.faa.gov or from your local FSDO. CAUTION: If a conditional sales contract is the evidence of ownership, an additional fee is required for recording. If there is a break in the chain of ownership of the aircraft (i.e., if it is not being purchased from the last registered owner), you are required to submit conveyances to complete the chain of ownership through all intervening owners, including yourself, to AFS-750. AC Form 8050-1 may also be used to report a change of address by the aircraft owner. The FAA issues a revised certificate at no charge. If the certificate is lost, destroyed, or mutilated, a replacement certificate may be obtained at the written request of the certificate holder. Send the request and fee to AFS-750. The request should describe the aircraft by make, model, serial number, and registration number. If operation of the aircraft is necessary before receipt of the duplicate certificate, AFS-750 may, if requested, send temporary authority by fax. You should include your full address, fax number, and contact telephone number in your request . If you are considering the purchase of an aircraft that is currently registered in a foreign country, you should be aware that multiple issues are involved with the registration process. You should contact AFS-750 for registration assistance. AC Form 8050-1, Aircraft Registration Application, includes an information and instruction sheet. Submit the white and green copies to AFS-750 and keep the pink copy in the aircraft as temporary authority to operate the aircraft without registration. This temporary authority is valid until the date the applicant receives the AC Form 8050-3, Certificate of Aircraft Registration, or until the date the FAA denies the application, but in no case for more than 90 days after the date of the application. Pink copy operation is valid only inside the United States. Figure 4-4 is a sample AC Form 8050-1. If by 90 days the FAA has neither issued the Certificate of Aircraft Registration nor denied the application, the FAA Aircraft Registry may issue a letter of extension that serves as authority to continue to operate the aircraft without registration. CAUTION: If you plan to operate the aircraft outside the United States within 90 days of submitting your registration documents, you should contact AFS-750 to request a temporary certificate by fax, also known as a “fly wire”. AC Form 8050-3 is issued to the person whose name is on the application. The pink copy is valid for 90 days and is legal only in the United States. Figure 4-5. 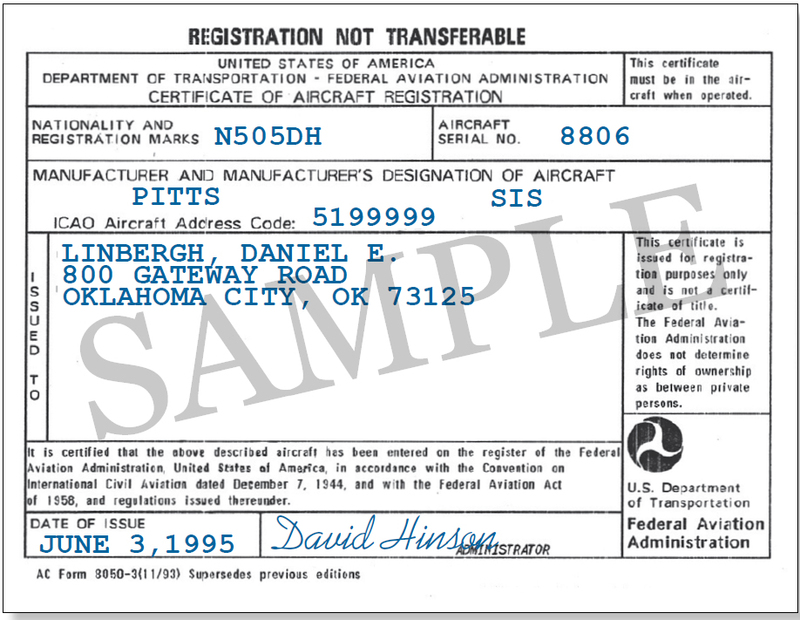 AC Form 8050-3, Certificate of Aircraft Registration. The FAA issues AC Form 8050-3 to evidence registration of your aircraft. The aircraft becomes registered under the laws of a foreign country. The registration of the aircraft is cancelled at the written request of the holder of the certificate. The aircraft is totally destroyed or scrapped. The holder of the certificate loses his or her U.S. citizenship or status as a resident alien without becoming a U.S. citizen. The ownership of the aircraft is transferred. Thirty days have elapsed since the death of the holder of the certificate. When an aircraft is sold, destroyed, or scrapped, the owner must notify the FAA by filling in the back of AC Form 8050-3 and mailing it to AFS-750. The U.S. registration and nationality marking should be removed from an aircraft before it is delivered to a purchaser who is not eligible to register it in the United States. The endorsed AC Form 8050-3 should be forwarded to AFS-750. 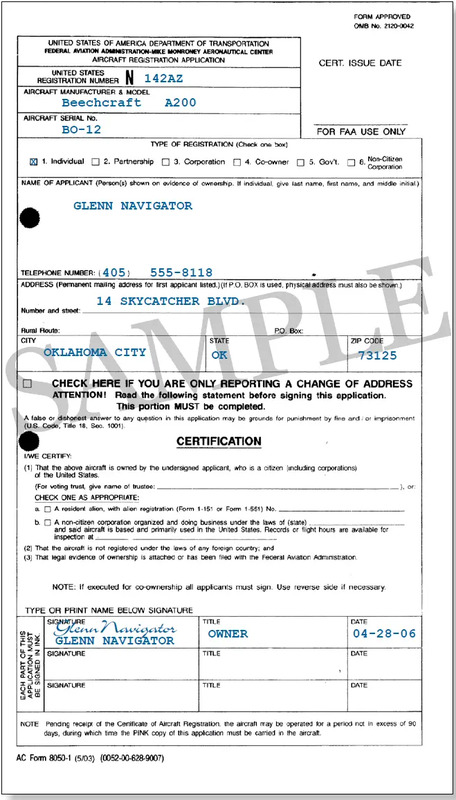 An AC Form 8050-6, Dealer’s Aircraft Registration Certificate, is an alternative form of registration. It is valid only for flights within the United States by the manufacturer or dealer for flight testing or demonstration for sale. It should be removed by the dealer when the aircraft is sold. 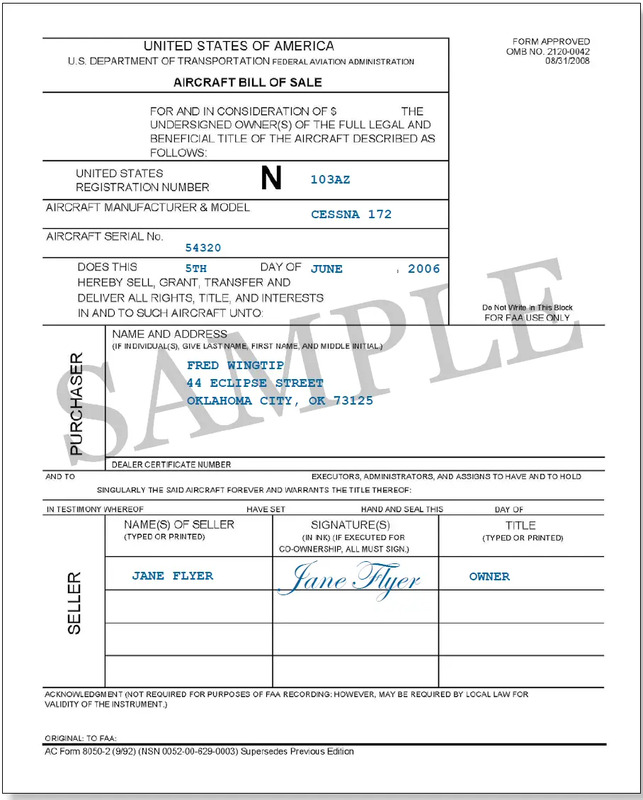 To apply for a Dealer’s Aircraft Registration Certificate, the applicant must complete AC Form 8050-5, Dealer’s Aircraft Registration Certificate Application. CAUTION: AC Form 8050-3 serves as conclusive evidence of nationality but it is not a title and is not evidence of ownership in any proceeding in which ownership is at issue. The FAA recommends that you apply for registration of your amateur-built aircraft 60–120 days before you finish building your aircraft, and before you submit FAA Form 8130-6 to the FAA. The FAA will not inspect your amateur-built aircraft before it has been registered or during construction of the aircraft. The FAA or a Designated Airworthiness Representative (DAR) in your geographical area inspects your amateur-built aircraft for general airworthiness only after you have made an application for an airworthiness certificate. The FAA does not charge a fee to the public for inspecting amateur-built aircraft. However, FAA workload may delay inspection of your aircraft. For this reason, the FAA staff is augmented by the use of DARs who may charge a fee for their services (14 CFR Part 183, Section 183.33(b), Designated Airworthiness Representative). The FAA Light Sport Aviation Branch (AFS-610) or your local FSDO can assist you with questions about the registration of light-sport aircraft. Aircraft owners should remember that state registration of aircraft is required in many states. You should check with your state government to ensure that you have met any applicable state registration requirements for your aircraft. 14 CFR part 47 specifies the requirements for registering an aircraft. For information concerning 14 CFR part 47 or any topics not discussed in this chapter, please contact AFS-750.